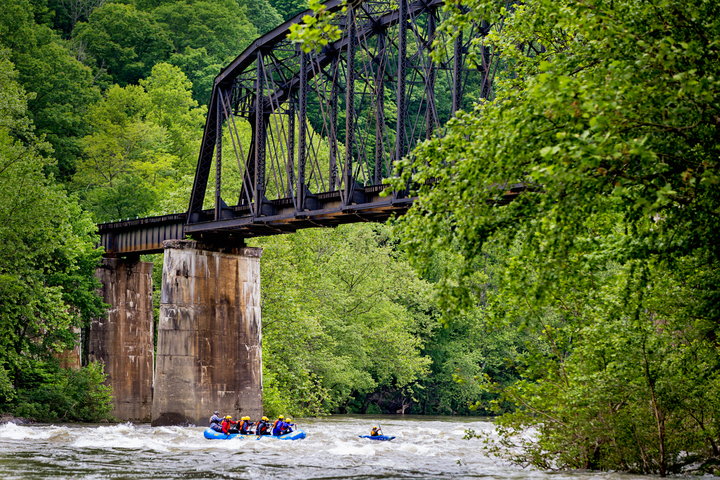 Rafters paddle beneath a historic trestle in the New River Gorge. Photo courtesy River Expeditions. Start the school-year off by unplugging with the kids on a whitewater rafting trip through the New River Gorge, a chasm deep enough and a journey wet enough to inhibit smart-phone use. The vice-president of River Expeditions, Heather Johnson says last-minute trips through the gorge are popular with families in search of end-of-summer fun, but the experience is about more than fun for children: it’s about immersion in nature. “It’s about unplugging from devices and being present with family, enjoying nature and adventure,” Johnson said. Johnson said the journey with a knowledgeable raft guide through the national park can also be a life-changing educational experience, ideal for older children. “As much as anything else, there’s the history of the gorge — a large part of the reason it was designated a national park and why the scouts established their Jamboree reserve here. Families who can’t make it in August are welcome to take advantage of River Expeditions’ Labor Day weekend specials September 1-3, which include New River rafting on Saturday and Sunday, a barbeque cookout after the trip, three nights of camping, and a light daily breakfast for $145 per person. Rafters may also buy a single day trip and get one free for $110 on Labor Day, Johnson said. In addition to rafting, guests of River Expedition also are provided access to zipline tours, rock climbing, mountain biking, and a paintball field on a 100-acre resort and basecamp at Fayetteville, West Virginia, near the rim of the gorge. Rafting on the nearby Gauley River gears up on the Friday after Labor Day, Johnson said. Previous articlePedal-train excursion leads tourists into remote central W.Va.